<strong>Sowing Seeds:</strong> One of the longest-running family ranches on the Gaviota Coast, Orella Ranch today remains in business while fast becoming a beacon for agriculture's new world order of sustainability. 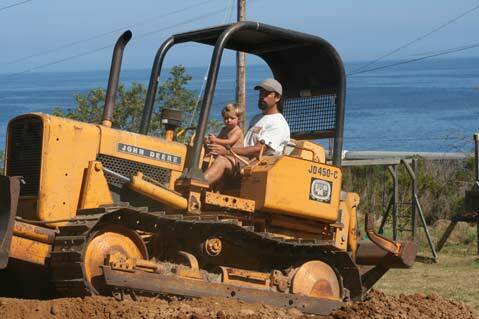 Orella owner Guner Tautrim and his son, Sequoia, make tracks on the property. 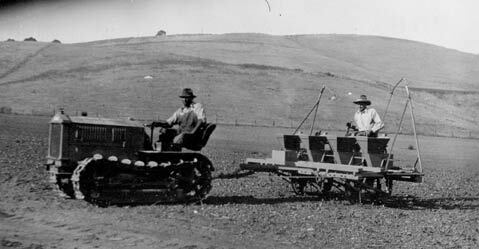 Guner's great-grandfather Martin Erro (left) and Asa Brown plant lima beans on the ranch circa the 1930s. Nestled a short distance east of Refugio State Park, the roughly 300-acre Orella Ranch is owned and operated by the descendents of Bruno Orella, who bought the land from original Spanish land grant holder Juan Camarillo more than 150 years ago. From dry farming foods like lima beans and tomatoes, to running cattle operations and wood mills, the ranch has endured for generations. Nowadays, the ranch is run by Bruno’s bloodline relative Mark Tautrim and, to an ever-increasing degree, his son Guner (who was one of 11 people appointed last week to the county’s newly created Gaviota Planning Advisory Committee) and daughter Kimberly. The latter two, along with their families, have helped usher in a new age on the ranch by developing a type of hybrid model that exemplifies what it takes for a family-run ranch to not just survive but thrive in this age of economic woe, crippling property and inheritance taxes, scarce water, and the ever-present beast of big-business farming. To that end, Orella Ranch is the site of Santa Barbara’s first-ever Carbon Economy Series this weekend. With an emphasis on self-reliance and “re-localizing” agriculture in a carbon-conscious way, the four-part series will be an unprecedented gathering of luminaries and hands-on workshops for not only the Santa Barbara region but for the West Coast at large. Offering daily participation or an “overnight” package that includes camping and home-cooked meals on the historic coastal ranch, the series starts on October 30 with Dr. Elaine Ingham’s three-day soil, food web, and composting technologies course. A soil microbiologist by trade with more than 30 years of experience, Ingham-who is director of research at Soil Food Web Inc.-will be providing a nitty-gritty presentation on the intricacies of dirt and the various ways one can improve it via homegrown fertilizers and compost without stepping on the toes of surrounding ecosystems. The second installment of the series runs November 10-15 and focuses on sustainable land use management techniques like water conservation, soil building, grazing, and general long-range planning. Kirk Gadzia, author of Rangeland Health, will be handling the first half of the week, while renowned Australian permaculture guru Darren Doherty will be talking during the second half about keyline design. He will also teach attendees how to drought-proof farms, deepen top soils, and maximize what little rain we get every year here on the South Coast. Gunter Pauli, one of the most respected names in the carbon-conscious movement, will be presiding over the series’ third event, Zero Emissions Research and Initiative (ZERI). Named after Pauli’s think tank at the United Nations University in Tokyo, the three-day course (which also features an open-to-the-public speaking engagement at Santa Barbara City College on December 5) will address one of the most basic and biggest problems facing wide-spread greening: money. The old model of sustainability requires you to invest more money up front, save some after the fact, and hope to break even over the long run with the hard-bit bottom line cushioned only by the peace of mind earned by going green. ZERI works to evolve this model by predicating itself on a mindset of abundance (think raw materials and the world around us) rather than the traditional “lack of” way of thinking. A highly synthesized and holistic sort of economic philosophy, Pauli’s course looks to bring synergy to various aspects of life in such a way that the whole becomes more powerful than any of the individual parts. The final part of the series-which will take place on December 10 and 11 with a public talk on December 9 at the Faulkner Gallery-will be taught by re-localizing expert Joel Salatin. A featured farmer in Michael Pollan’s popular book The Omnivore’s Dilemma and the film Food, Inc., Salatin will be preaching the powers of investing in the local production of food, energy, and goods and how to navigate the pitfalls, both political and practical, that you encounter along the way. The revolution starts this weekend. For more info go to carboneconomysb.com.